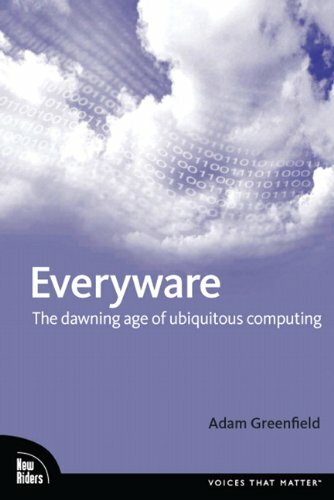 Smart buildings, smart furniture, networked street signs and self-describing soda cans, all of these are facets of ubiquitous computing the author calls "everyware". This work explains how everyware is reshaping our lives, transforming our understanding of the cities we live in, the communities we belong to - and the way we see ourselves. Ubiquitous computing--almost imperceptible, but everywhere around us--is rapidly becoming a reality. How will it change us? how can we shape its emergence? Smart buildings, smart furniture, smart clothing... even smart bathtubs. networked street signs and self-describing soda cans. Gestural interfaces like those seen in Minority Report. The RFID tags now embedded in everything from credit cards to the family pet. All of these are facets of the ubiquitous computing author Adam Greenfield calls "everyware." In a series of brief, thoughtful meditations, Greenfield explains how everyware is already reshaping our lives, transforming our understanding of the cities we live in, the communities we belong to--and the way we see ourselves. What are people saying about the book? "Adam Greenfield is intense, engaged, intelligent and caring. I pay attention to him. I counsel you to do the same." --HOWARD RHEINGOLD, AUTHOR, SMART MOBS: THE NEXT SOCIAL REVOLUTION "A gracefully written, fascinating, and deeply wise book on one of the most powerful ideas of the digital age--and the obstacles we must overcome before we can make ubiquitous computing a reality." --STEVE SILBERMAN, EDITOR, WIRED MAGAZINE "Adam is a visionary. he has true compassion and respect for ordinary users like me who are struggling to use and understand the new technology being thrust on us at overwhelming speed." --REBECCA MACKINNON, BERKMAN CENTER FOR INTERNET AND SOCIETY, HARVARD UNIVERSITY Everyware is an AIGA Design Press book, published under Peachpit's New Riders imprint in partnership with AIGA.